Bassett's MODERN Collection makes it comfortable to bring modern glamour to everyday living. 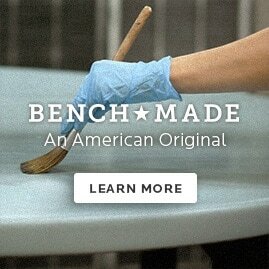 Combine our Bench*Made Maple top with our MODERN Astor base. Available in 16 wood finishes, a standard edge or live edge table top, brass or stainless steel base, and two extra-large sizes (90" and 108"). So, your extended family will have plenty of elbow room! This MODERN dining table stands proud on a shimmery, metallic, geometric base. 90" seats up to 8, 108" seats up to 10.